IADC announces the launch of its new accreditation program for Helicopter Underwater Escape and Water Survival Training (HUET) for the Gulf of Mexico (GoM). At the request of oil and gas operators in the GoM, IADC and its committee members developed the curriculum and the program requirements for accrediting training providers to deliver a 1-day HUET course that consistently meets a high standard. This course, built by the industry for the industry, focuses on the specific knowledge and skills needed to prepare personnel for helicopter transport to warm-water work locations. The HUET Development Team (comprising primarily operators and drilling contractors) formed in early 2013 to conduct extensive research, develop the program requirements, refine the curriculum, and fully vet the new program. The research conducted during this phase included standards and programs developed by the US Coast Guard; BOSIET/OPITO; API; BSEE/SEMS; the US, Australian, and Canadian aviation authorities; and the IADC North Sea HUET program requirements, among others. Bill Chiles, the president and CEO of Bristow Group, also reviewed IADC’s HUET course: “We are in support of the IADC course.” The company’s VP & Chief Safety Officer said, “the IADC course is an example of essential training for passengers flying in the GoM.” Bristow Group is an offshore helicopter transport services company. Requirements of the program are specified in the Handbook of Accreditation (Document HUE-01) and the curriculum document (HUE-02), available on the IADC website: www.iadc.org/huet. The program is now accepting applications, which can be obtained from IADC’s Accreditation and Credentialing Division through the email address huet@iadc.org. Additional information about the new HUET program will be communicated in IADC publications and directly to training providers in January 2014. In the December 9, 2013 Federal Register OSHA is proposing to remove the oil and gas well drilling and servicing operations exemption from Process Safety Management (PSM) and Prevention of Major Chemical Accidents coverage. The preamble to the PSM final rule explained that OSHA excluded these operations because it had begun a separate rulemaking for oil and gas well drilling and servicing operations (48 FR 57202). However, the Agency subsequently removed the oil and gas well drilling and servicing operations rulemaking from its regulatory agenda and OSHA never promulgated a final rule for these operations. In light of this history, OSHA requests public comment on whether to retain or remove the exemption as stated in § 1910.119(a)(2)(ii). IADC is seeking input from member companies on this issue. Comments and additional material on this Request for Information must be submitted by March 10, 2014. All submissions must bear a postmark or provide other evidence of the submission date. For more information, please contact Joe Hurt at joe.hurt@iadc.org. In June 2010, at a Diplomatic Conference in Manila, the Philippines, major amendments were adopted to the STCW Convention and Code (the “Manila Amendments”). With keen insight, IADC realized that these amendments would ultimately impact IMO Resolution A.891(21) – The Recommendations on Training for all Personnel on MOUs (published in 1999), and as such, the offshore industry. Following the conference IADC formed a task force to draft the revisions for IMO Res. A.891 to update the training required by offshore mariners as reflected in the new STCW amendments. This task force, led by John Pertgen, IADC Director of Offshore Technical and Regulatory Affairs, was comprised of both flag State representatives and IADC members, who worked diligently until it was completed in 2012. Thereafter, they submitted to IMO their revised draft resolution, which was then reviewed and endorsed by the STCW Subcommittee, the Maritime Safety Committee and ultimately approved at the IMO 28th Assembly in December 2013. This updated reference will be re-issued soon as IMO Resolution A.1079(28) and entitled Recommendations for the Training and Certification of Personnel on Mobile Offshore Units (MOUs). For more information, please contact John Pertgen at john.pertgen@iadc.org. API announced the publication of API Bulletin 97, Well Construction Interface Document Guidelines, First Edition, on 4 December. The newly published documents provides guidance on information that is to be shared regarding well construction and rig specific operating guidelines. It is intended to align the lease operator’s safety and environmental management system (SEMS) with drilling contractor’s safe work practices (CSWP). The guidelines were developed by joint industry tasks forces, whose members examined every aspect of safety systems, including equipment, operating practices, sub-sea well control and spill response with the objective of strengthening standards. The groups also worked with the Department of the Interior and the presidential commission to help with their recommendations for offshore safety improvements, including changes to regulations. For more information, please contact Alan Spackman at Alan.Spackman@iadc.org, or Julia Swindle at Julia.Swindle@iadc.org. A healthy cross section of the 125-plus subject matter experts revamping the “IADC Drilling Manual” participated in a year-end progress meeting and celebration during December. Weatherford International graciously sponsored the event at their Houston headquarters. “The Drilling Manual Team boasts some of the most distinguished and knowledgeable experts in the industry, who have shared their time and talents freely and generously on this major project,” remarked Mike Killalea, group vice president/publisher. “IADC thanks them all, and looks forward to completing the 12th edition in the coming year. 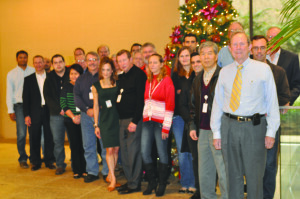 IADC Drilling Manual writers attended a year-end update meeting and holiday celebration at Weatherford International headquarters in Houston. The “IADC Drilling Manual,” the definitive operating reference for drilling operations, will feature sweeping rewrites and updates of existing chapters, and many entirely new ones. The 12th edition will include new chapters and material on managed pressure drilling, casing while drilling, drilling problems and solutions, special operations, automation, top drives and more. Currently, more than half of the roughly 30 chapters are already written and being peer reviewed and copy edited. IADC plans to begin offering chapters electronically by mid-year, with the printed volume produced later in the year. For more information, contact Fran Kennedy-Ellis at fran.kennedyellis@iadc.org. The IADC Australasia Chapter, in partnership with the National Offshore Petroleum Safety and Environmental Management Authority (NOPSEMA), hosted a workshop on 21 October in Perth to discuss the application and interpretation of Performance Standards on MODUs operating within NOPSEMA waters. The regulatory recently identified deficiencies related to the standards in use during inspections. Workshop participants came together to promote the role of performance standards and a means of achieving regulatory compliance. IADC-AC members welcomed the opportunity to participate and the workshop was well attended and supported by all MODU operators currently working in the regime, with active participation of appropriate operational personnel. The workshop was also attended by Alan Spackman, Vice President, Offshore Division, IADC Houston, who provided the attendees with an update on revisions to the IADC HSE Case Guidelines. IADC-AC Vice Chairman Julian Soles details the agenda for the IADC-AC/NOPSEMA Performance Standards Workshop in Perth on 21 October. The workshop provided an opportunity for NOPSEMA to better describe how the content and structure of performance standards can be developed based on the ‘goal setting’ legislative framework, by considering a range of different input sources. For example: safety case formal safety assessment and safety management system; engineering standards and specifications; facility basis for design, statutory, class and flag requirements. Examples of different performance standard approaches and formats were demonstrated. The approaches and formats showed a common theme by specifying the measurable performance criteria that control measures are required to meet and providing a linkage to the maintenance management system assurance activities required to maintain the performance of the Control Measures. Transocean provided an overview of its operational integrity process from defining a major hazard’ and determining major hazard barriers (safety critical elements/systems)’ through to a future stage of assessing the integrity of the major hazard barriers. Atwood Oceanics provided an overview of how their performance standards interface with their maintenance management system, a system which has been in development since 2011. Atwood Oceanics’ has since developed 23 performance standards with robust, demonstrable linkage from the safety case and control measures through to maintenance job plans and condition based monitoring. 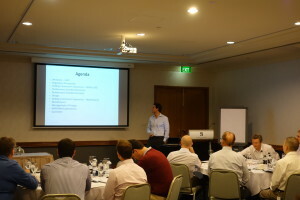 Please visit the IADC website for more information on the IADC Australasia Chapter. IADC, together with OGP and IMCA, represented the oil and gas industry at the EUOAG meeting on 21 November in Brussels. Klaus Dieter Borchardt, chairman of the EUOAG opened the session, noting while the prime goal of Annex IX is to obtain data for benchmarking within EU member states, it is not its only objective. Sharing of best practices is also a key item. Vice chairman Steve Walker gave an overview of the proceedings on the common data reporting format as per Annex IX of the EU directive on offshore safety. Importantly, the EUOAG believes that this should not duplicate other efforts already existing in the EU. IADC and OGP noted that the reporting under this directive should not cause over-reporting on incidents and the main purpose of reporting should be gathering data for lessons learned. IMCA provided comment on the document, stating they would send in more detailed advice on Item D of Annex IX on definitions of ‘loss of station’ of DP vessels. Overall the three industry organizations stressed that reporting under Annex IX of the Offshore Safety Directive should be based on ‘unintended’ events that have the potential to cause a major incident. EUOAG stated their proposals will include guidance to this effect. For more information, please contact John Boogaerdt at John.Boogaerdt@iadc.org. On 11 December, IADC participated in a members’ day organized by IRO, the Dutch Offshore Suppliers Association, in Den Helder, a naval port in the Netherlands. The port serves the oil and gas industry in the North Sea. The event covered a number of infrastructure improvement initiatives recently undertaken at the port. Royal Dutch Navy Commander C. Boelema Robertus and Mr. P.H. 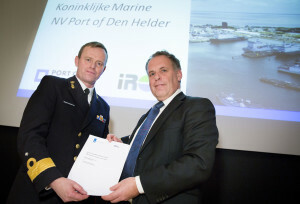 Kolff of the Port of Den Helder participate in the signing ceremony on 11 December. Key to the day’s events was the signing of the cooperation intention between the port of Den Helder and the Royal Dutch Navy, traditionally the mainstay of the northern Dutch town, as they own and operate most of the harbour facilities. Commander Kees Boelema Robertus, Director Material and Support of the Royal Dutch Navy, signed the agreement, along with Piet-Hein Kolff, General Director of the Port of Den Helder. Together with the Royal Navy, the port facilitates and stimulates economic growth for companies and industry, including the offshore and defense industries, fisheries, naval research and training. In the future, more offshore supply and support vessels will be able to use the Navy’s quayside as well as the Naval facilities. The cooperation intent will support future activity.